← Exercise Your Free Speech Rights — Or Keep Your Job? Copyright trolls are like this cave troll: poised to drop a hammer on the unwary at any moment. The photo is mine (taken in 2004 outside Te Papa Tongarewa museum in Wellington, NZ). The photo is copyright free; the troll is not. 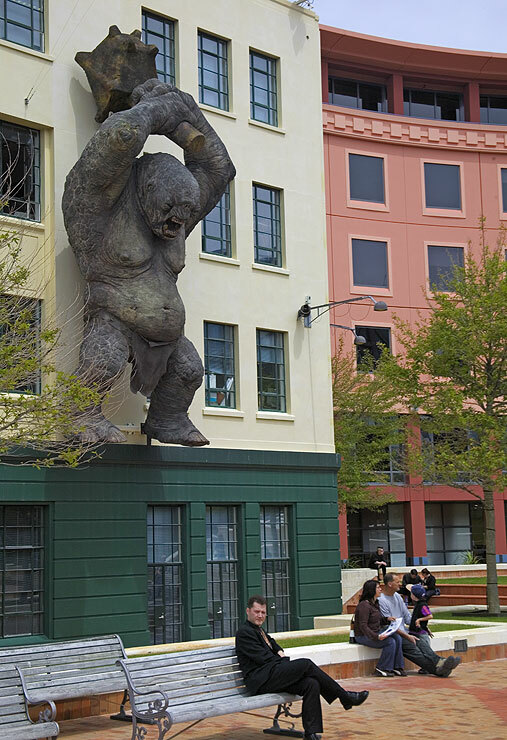 Freelance journalist Tam Harbert published an excellent article recently on her Company of One blog about the rise of copyright trolls – law firms and companies that acquire copyrights and then troll the Internet, looking for infringing uses so they can sue. Copyright trolls are here to stay, because the blogosphere and social media offer them a mass of potential defendants. A career as a copyright troll can pay very well. Copyright law provides for “treble damages” in a copyright infringement case. Who decides what something is worth? Technically, the court does. But in reality, the person suing will come to court prepared to offer a fair market value for their work, and the court usually accepts it if they can support the value. So how lucrative can it be to sue someone for copyright infringement? Consider the celebrity photos that I have taken over the years — backstage, at parties, during interviews, and in a variety of public places from A&R conferences to recording studios and the annual NAMM conference. I’m not a great photographer, but if I had to argue the value of images tucked away in my file boxes, the argument would go something like this. Similar celebrity photos are worth thousands of dollars. My photos are good, many of them have never been published and some are unique. Therefore, my photos are worth approximately the same price at which other photographers have sold images of the same celebrity. Consider my very first celebrity photo. I was 9, hanging around a service corridor at the local arena while my grandfather delivered supplies to the concession stand. I had his Yashica 35J camera loaded with black and white film. Some guy I didn’t recognize came by, leaned up against a wall, and lit a cigarette. I thought he looked interesting because I’d never seen anyone wearing a leather jacket before, so I took his picture. How much is my photo of John Lennon (leaning against a brick wall in a black leather jacket and white T-shirt, looking incredibly young and tired, staring at nothing in particular with a Mona Lisa smile) worth? I don’t know — I’ve never had it valued. A year later, I find dozens (if not hundreds) of unauthorized uses of my photo. I want compensation, but I don’t want to take the time and trouble to sue. So I license the right to sue for copyright infringement to a copyright troll. The trolls pay me a flat fee (or a percentage of what they collect), and start suing every website, blog, and social media page where the search engine finds my photo. The result: dozens or hundreds of judgements for three times the “fair market value” ($1,500 X 3 = $4,500 per unauthorized use). Copyright trolls nearly always win, because there’s no real defense. Either you published it without permission, or you can produce a bill of sale or copyright transfer. Purchased work that grants you specific publication rights. Works offered through a Creative Commons license. Works the copyright owner gives you permission to use. Don’t mistake the point of this post. I strongly believe that photographers, writers, artists, musicians and others who create intellectual property deserve protection and payment. But copyright trolls seldom create much of anything except paperwork and trouble. So the point of the post is to remind us all not to contribute to their money market accounts by inadvertently using material we shouldn’t. Disclaimer: I am not a lawyer. Consult a qualified attorney if you need information on copyright law. Gallery | This entry was posted in Uncategorized and tagged blogging law, copyright infringement, copyright protection, copyright troll, Creative Commons license, Deb McAlister, intellectual property, John Lennon, photo copyright, sued for online content. Bookmark the permalink.